Aluminum is the raw material of choice for numerous applications in a variety of industries for its tremendous versatility. One of the applications that is especially well suited for aluminum is forging. Both 6061 and 6063 aluminum alloys are popular choices for these applications, and because of their similarities, it can sometimes be difficult for customers to choose between them. What Exactly is Aluminum Forging? Forging is a process that transforms a solid bar into particular shapes. Because of the metal’s physical characteristics, aluminum is especially popular material type for forging. Aluminum alloys offer both malleability and formability that means they can be easily machined and cast, but they are as much as one-third the density of steel. This results in forgings that are both strong and stable, at a reduced cost relative to other materials. This is why aluminum is the most common metal used in forging. Like steel forging, the aluminum forging process begins with designing and creating the die that will shape the raw material. Once this has been done, aluminum billet is heated up in a forge to high temperatures. Next, a lubricant is added to the aluminum to prevent it from sticking to any of the machinery. It is then placed on the loader and pressure is applied with a ram that propels the aluminum through the die. During this process, nitrogen is added in order to prevent oxidation. The aluminum forged part will pass completely through the die and out the other side. It has now been elongated in the shape of the die opening. The finished forging is then cooled, and if necessary, a process of straightening and hardening creates the finished product. There are also numerous options for transforming the color, texture, or finish, as well as anodizing the forgings. Aluminum is known for the diversity of its alloys, but not all of them are suitable for forging. Generally, two classes of aluminum alloys are used in forging: 6000 series, and 7000 series. Both 6000 and 7000 series alloys are heat treatable. For the 7000 series, these alloys offer excellent weldability and greater strength in the parts of the material that have been heat affected than the 6000 series. The drawback is that they do not have the same level of corrosion resistance and formability as the 6000 series. The 6000 series is well recognized for its excellent forging ability. In addition, these alloys can be heat treated at the forging temperature, making them strong, easily weldable, and corrosion resistant in the harshest environments. That’s why this series is extremely popular for forging applications in a number of industries, in particular construction. 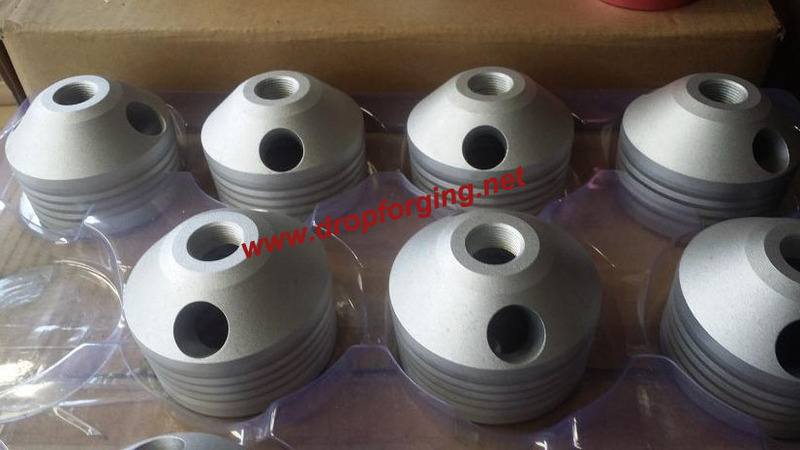 How to Choose Between 6061 and 6063 Aluminum Forging? 6061 and 6063 aluminum alloys are the most common alloys for forging. Although they possess many of the same qualities, they each offer their own distinct properties that mean manufacturers need to do their research when deciding between them. The second most popular aluminum for forging, 6061 is precipitation-hardened and uses magnesium and silicon as its major alloying elements. It was first developed in 1935 as part of the early advances in the aircraft industry. It offers good weldability and machinability, good joining characteristics, accepts applied coatings well, and is highly corrosion resistance while having a high strength to weight ratio. In contrast, 6063 is the most popular aluminum used for forging. It also uses magnesium and silicon as its alloying elements. Its unique properties allow it to be formed into complex shapes with very smooth surfaces, making it fit for anodizing. Its major drawback compared to 6061 is that it does not have the same level of strength. In comparing the specific properties of the two alloys, 6061 has a density of 2.7 g/cm cubed. The Young’s modulus is rated at 68.9 GPa with a tensile strength of 124-290 MPa. The elongation at break is 12-25%. It has a melting temperature of 585 degrees Celsius, thermal conductivity of 151-202 W/(m·K), and a specific heat capacity of 897 J/ (kg·K). The linear thermal expansion coefficient is 2.32 x 10−5 K−1. Finally, the volume resistivity is 32.5–39.2 nOhm·m. By contrast, 6063 offers a density of 2.69g/ cm3. It’s Young’s modulus is 68.3 GPa and it has a tensile strength of 145–186 MPa. It has a slightly higher elongation at break at 18-33%. 6063 offers a melting temperature of 615 °C, thermal conductivity of 201-218 W/(m·K), and a specific heat capacity of 900 J/ (kg·K). The linear thermal expansion coefficient is 2.34 x 10−5 K−1, and the volume resistivity is 30-35 nOhm·m. Of course, knowing the listed specifications is not the same thing as seeing how an alloy actually responds to your particular application. Manufacturers need to take the time to test an alloy to ensure it performs as desired with their production processes. Aluminum, because of its formability and versatility, is especially useful for this kind of forging. No matter what your particular application, you need an aluminum forging supplier who can be your partner in the production process. At Fly Forge, we take pride in working with our customers to be their technical resource partner, and we will do our best to help you select the right material for your needs of aluminum forgings. Contact us right now if you would like to source an aluminum forging company from China!